While it has always been possible to embed Videos and Music into Microsoft PowerPoint presentations, it wasn’t always easy to manipulate them after they were placed into the presentation. 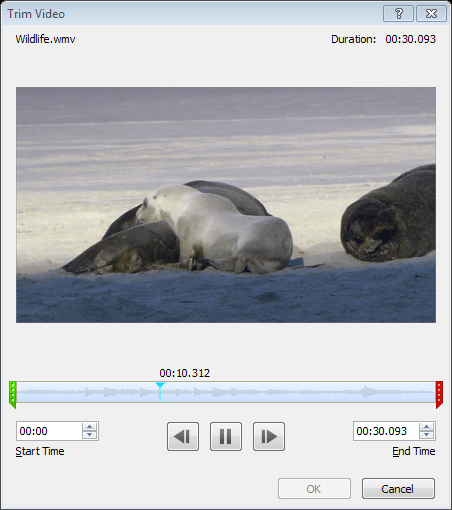 For instance, if you had a video that was originally 5 minutes long, but only wanted to use a 1 minute portion of it in your presentation, you had to edit the length of the video before you inserted it into your presentation. 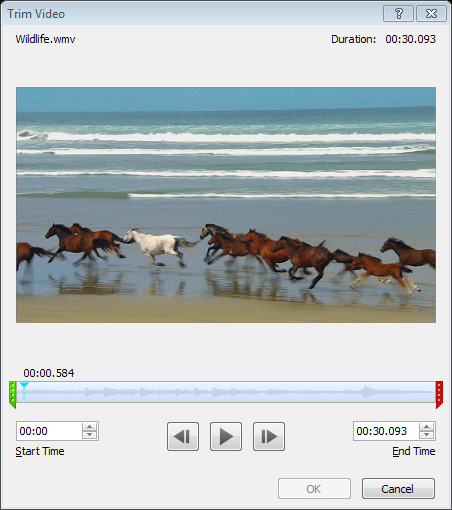 In the newer versions of Microsoft Office (2010 and 2013) Video and Sound Editing tools have been added that make these kinds of adjustments easily after the Video or Sound object has been inserted into the presentation. For example, let’s say you have a video already inserted into a slide, but you only want to use a small portion from the middle of the video. 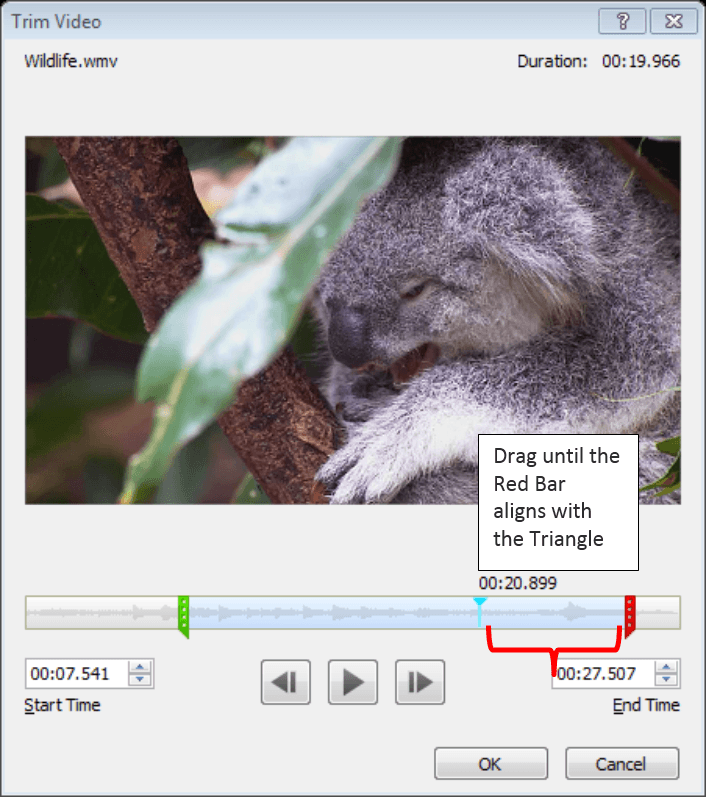 First, click on the video object on the slide, so the contextual Video Tools tabs appear at the top of your screen, then click on the Playback Tab. On this Ribbon, look for the Editing group, and in this group, click the Trim Video button. 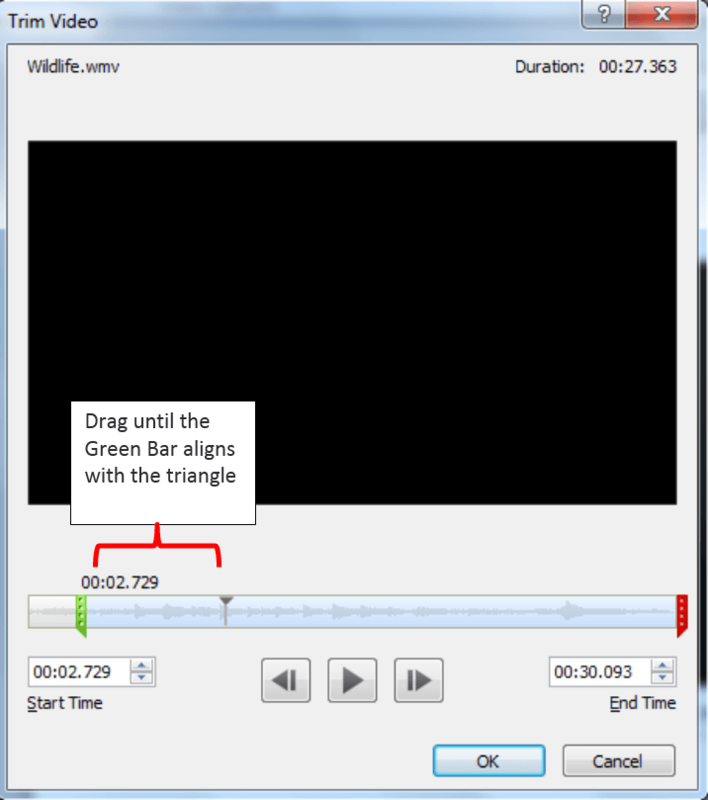 In the Trim Video dialog box, click the Play button to start viewing the video. As the video starts to play, you will see a timer that shows how far into the video you are as the video plays, and a small blue triangle will begin to move from left to right along a bar beneath the timer. When your Video reaches the point where you wish to start it in your presentation, click the Pause button, and note the position of the small blue triangle on the bar. Now that you’ve paused the video at the point where you want it to start, simply click and drag the Green end of the Timer bar to the right until it aligns with the triangle. As you do this, also note how the Start time of the video is now set. Then, click the Play button again to advance your video. The small blue triangle will continue to move to the right along the bar. When you reach the point where you want the video to end, click the Pause button again to stop the movement of the Triangle. Finally, click and drag the Red bar on the right end of the timer bar until it meets the triangle and click OK. Also note how this sets the End time of the video. That’s all there is to it! Now, when you deliver the presentation and activate the video object, your audience will only see the portion of the video that you “Trimmed” out of the original video clip. For more Microsoft Applications Training information visit www.directionstraining.com or call 1-855-575-8900.